The chemical weathering process of carbon dioxide in the atmosphere dissolving in rainwater to form carbonic acid, which dissolves rocks and then flows into the oceans, stores around 0.3 billion tons of atmospheric carbon in rivers and in the oceans every year. A new study suggests that this weathering process could play a significant role in future climate change models. Chemical weathering of rocks by carbon dioxide dissolved in rainwater has never been taken into account in models of future climate change so far. However, researchers from the Laboratoire Géosciences Environnement Toulouse (CNRS/IRD/Université Toulouse III – Paul Sabatier), in collaboration with the Laboratoire des Sciences du Climat et de l’Environnement (CNRS/CEA/UVSQ) and the University of Bergen (Norway), have now demonstrated its sensitivity: the higher the carbon dioxide levels in the atmosphere, the more powerful the carbon sink, which accelerates the dissolution of rocks. The study suggests that this mechanism should be incorporated into any models of future climate change. The research is published in the journal Nature Climate Change dated March 2012. The carbon dioxide in the atmosphere dissolves in rainwater forming carbonic acid, which, once in contact with rocks, slowly dissolves them. This atmospheric carbon is then transported by rivers into the oceans, where it is trapped for several thousand years, before returning to the atmosphere or alternatively being stored in marine sediments or in corals. This chemical weathering process stores around 0.3 billion tons of atmospheric carbon in rivers and in the oceans every year: although this is considerably less than human-induced CO2 production (around 8 billion tons per year), it is roughly equivalent to the net exchange flux between the atmosphere and the terrestrial biosphere (vegetation, soil, humus, etc) under preindustrial conditions (0.4 billion tons). Despite this, chemical weathering of the continents has never been taken into account until now in models of future climate change. Admittedly, this supposedly slow flux was recognized as being one of the major carbon sinks on million-year timescales, but considered as insignificant on timescales of a century. However, measurements recently carried out by US researchers in a highly populated river basin (the Mississippi) suggested that this process could play a significant role, even on century timescales. But this role remained hard to assess, due to the extent of agricultural activity in the basin. In order to eliminate, as much as possible, the impacts related to land use change and isolate the role of the climate in the chemical weathering of rocks, the researchers chose to study one of the biggest Arctic watersheds, the Mackenzie River basin, located in north-west Canada. They used a first numerical model to estimate future climate change, doubling the amount of CO2 in the atmosphere (a level likely to be reached by 2100). 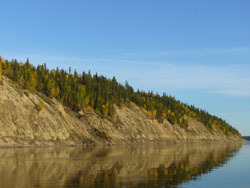 Under these conditions, temperatures increased by 1.4 – 3 °C and average precipitation by 7% in the Mackenzie River basin. This predicted climate was then inputted into a second model capable of simulating the productivity of the biosphere and soil hydrology, making it possible to calculate the chemical dissolution of minerals. The scientists found that when the amount of atmospheric CO2 rose from 355 ppmv (at the end of the twentieth century) to 560 ppmv (by 2100), the Mackenzie River basin responded by capturing 50% more atmospheric CO2 through chemical weathering. 40% of this increase is directly linked to climate change (higher temperatures and rainfall accelerate mineral dissolution), while the remaining 60% is put down to changing vegetation activity: higher atmospheric CO2 levels reduce evapotranspiration in plants, which intensifies circulation of water in soils. The increased circulation speeds up chemical weathering of rocks. This research has thus demonstrated the high sensitivity of continental chemical weathering to human-induced climate change. Atmospheric CO2 consumption through this process could rise by 50% by 2100. The sensitivity of this flux to climate change would then be equivalent to the flux related to the terrestrial biosphere. In the Mackenzie River basin, where rainfall will tend to increase, streams and rivers will capture more carbon as the climate becomes warmer and atmospheric CO2 levels rise. Will this trend be the same in regions that become more arid? Given its high sensitivity, will continental chemical weathering allow excess CO2 to be absorbed, leading to a more rapid return to equilibrium than predicted? Many questions remain unanswered, especially the sensitivity of this process to human activity (changes in land use, air pollution, etc). However one thing is certain: chemical weathering will now need to be incorporated into each and every model of future terrestrial climate change. This research was funded in particular by CNRS’s EC2CO program. Images: GET/Emilie Beaulieu; Beaulieu et al. High sensitivity of the CO2 sink by continental weathering to the future climate change. Emilie Beaulieu, Yves Goddéris, Yannick Donnadieu, David Labat, Caroline Roelandt. Nature Climate Change, March 2012 (DOI : 10.1038/NCLIMATE1419). Be the first to comment on "The Role of Climate Change in Chemical Weathering of Rocks"